Each time Hector watches white boys playing soccer in Johannesburg, South Africa, he dreams of playing on a real pitch one day and after the fall of apartheid, when he sees the 1996 African Cup of Nations team, he knows that his dream can come true. 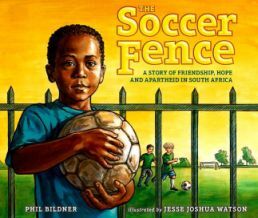 Soccer Fence: The Story of Friendship, Hope, and Apartheid in South Africa by Phil Bildner is beautifully illustrated by Jesse Joshua Watson.The story begins with a young boy, Hector, in a Johannesburg township who loves soccer. When Hector travels with his mother to her work, he sees the nicer fields where the white children play. He vows to play on those fields one day. The book chronicles the political events that shape Hector’s life experiences including the release of Nelson Mandela, democratic elections, and the 1996 African Nations Cup where the South African team, Bafana Bafana, was victorious. The book then provides the same conclusion that we see too often in children’s books about the Civil Rights Movement. The game is credited with bringing blacks and whites together, over the “soccer fence.” A white boy invites Hector to play on the nice field, and their friendship signifies the happy ending. The fight for civil rights and the fight against apartheid are reduced to the desire of the black child to play with a white child. It reinforces the myth that the injustice was about segregation, not about a gross inequity in resources and a system of daily oppression. To the extent that the demands in South Africa and the U.S. were for integration, it was for equal access to resources, not access to white playmates. My other serious concern is that the narrative description at the end of the book, written for young readers, says “The global community objected to the South African government’s racist policies.” The more detailed “Apartheid Timeline” makes a similar statement, “People and governments around the world launch an international campaign to boycott South Africa.” Since any reader would assume the U.S. is part of the global community, it gives the false impression that the U.S. government was on the side of justice. This could not be further from the truth. Not only did the U.S. government not object to the apartheid government, it actively supported the oppressive and terrorist regime.